Shinto Muso-ryu jo is said to be the oldest style in Japan for using a stick (jo) in combat. It was founded in the early 17th century by Muso Gonnosuke Katsuyoshi, an exponent of Tenshinsho-den Katori Shinto-ryu. Shinto Muso-ryu oral tradition maintains that Gonnosuke once fought Miyamoto Musashi, one of the most famous swordsmen of the time, with a staff (bo) in a training match and was defeated by Musashi's cross-block (jujidome) technique. According to legend, Gonnosuke was dissatisfied with this outcome and retired to Mt. Homan, in what is now Fukuoka Prefecture, in Kyushu, where he engaged in a series of shugendo austerities, all the while contemplating the reasons for his defeat. Finally, he received "divine" inspiration about a new method of using a staff-like weapon, making it shorter (128cm) and thinner (26mm) for more rapid manipulation. 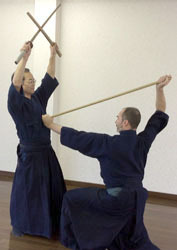 He devised a number of techniques for this new weapon, which he called a stick (jo) (as opposed to staff or bo), that included the use of the thrust of a spear, strike of a sword and staff and sweep of a naginata. Factual documents of the ryugi are quite rare. It is said that there is a record at Tsukuba Shrine, in Ibaraki Prefecture, that reports that Gonnosuke was able to defeat Musashi in a rematch. Training is conducted in formal two person pre-arranged kata. In Shinto Muso-ryu jo there are a total of 64 kata which are divided into a number of sets, each with a different character. 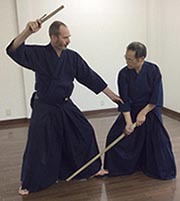 Exponents begin their study of jo by learning a set of twelve basic techniques (kihon waza), which contain all the essential movements of the style. They then proceed through the different sets of kata of stick versus sword(s). 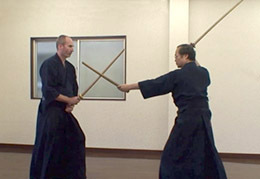 The separate roles of Uchidachi and Shidachi are used for all kata practice, however the true nature of the relationship between Uchidachi and Shidachi is not an adversarial or competitive one. Rather the role of Uchidachi, being the more experienced and senior exponent, is that of the teacher who humbly leads and draws up Shidachi as a student, both technically and mentally, through an ongoing process of refinement and one-on-one interaction over time. Also included in the curriculum of Shinto Muso-ryu are twelve kata of the swordsmanship system called Shinto-ryu kenjutsu. The first eight kata are long sword vs long sword, followed by four kata that are long sword vs short sword. We hold full public liability and professional indemnity insurance through SportsCover Australia, and operate on a non-commercial (non-profit) basis with membership/insurance and training fee schedules that are intended to cover costs only, like venue hire and liability insurance. In terms of SMR styles, we follow the lineage from Shimizu Takaji Shihan. In Australia, our dojo has been uniquely exposed to the teachings of both Hamaji-ha and Nishioka-ha, and those differences between Shimizu Shihan's first and last menkyo-kaiden respectively. Regardless of previous martial arts experience or none, you're welcome to come and watch a class with prior arrangements. Also feel free to visit one of our Sponsor's websites..